Potato is boiled and deep fried. Steamed rice is mixed with fresh yogurt and seasoned with spices. The deep fried potatoes are mixed with yogurt rice as a last step. Serve potato yogurt rice immediately with any pickle if desired. Makes: around 4 Servings of Potato Yogurt Rice. Remove stems, wash and chop the green chiles into small pieces. Peel, wash and finely chop the ginger. Peel and chop the potato into small chunks. Boil the chopped potato in salted water till they turn soft. Strain the boiled potatoes and place on the kitchen towel to absorb any remaining water. Deep fry the boiled potatoes till brown and crisp from outside. Remove the deep fried potatoes onto absorbent paper. In a mixing bowl, mash the steamed rice with back of the spoon. Add the yogurt, turmeric powder and salt to the mixing bowl and mix everything well. Add a splash or two of fresh water if necessary to the mixing bowl. When mustard seeds start spluttering, add ginger and green chiles. Fry briefly and remove from heat. Once warm enough, add the above talimpu to the yogurt bowl. Stir in fried potatoes to the yogurt bowl and serve potato yogurt rice immediately. Notes: Make sure potatoes are added to yogurt rice just before serving. Suggestions: Microwave the rice with a splash of water for a minute or two if using leftover steamed rice. Adjust spice with green chiles or red chiles. Use fresh plain thick yogurt if available. Variations: Check other variations with yogurt here. Other Names: Potato Yogurt Rice. Steamed rice is ground into paste with sour yogurt and mixed with chopped onion and spices. The mixture is then dropped in hot oil and deep fried till golden brown in color. Serve rice yogurt pakora immediately. Makes: around 4 Servings of Steamed Rice Yogurt Pakora. Wash and tear curry leaves. If using leftover steamed rice, add a splash of water and warm up the rice in microwave for couple of seconds. Grind rice, yogurt, salt into paste using a grinder. In a mixing bowl, add ground rice yogurt paste, rice flour, chopped onion, green chiles, cumin seeds, curry leaves and cilantro. Make sure the mixture is thick but not wet. Adjust yogurt accordingly. Heat oil in a deep frying pan on medium low heat. Scoop rice pakora mixture and carefully drop in hot oil. Repeat the same till the surface of oil is filled. Deep fry the rice yogurt pakora on all sides till golden brown in color. Once crisp, remove the pakora onto absorbent paper. Repeat the same with any remaining rice yogurt mixture. Serve rice yogurt pakora immediately. Notes: Make sure to fry the pakora well. Suggestions: If the rice yogurt mixture is thin, add more rice flour. Leave the yogurt at room temperature overnight to make it little sour. Variations: Check other fritter recipes here. Other Names: Steamed Rice Yogurt Pakora. Raw rice is soaked in yogurt along with sago. The mixture is then ground into smooth thick batter which is poured onto a flat plan into a dosa. The dosa is then layered with onion and cooked till done. Serve rice sago dosa immediately with any pickle of your choice. Makes: around 2 Servings of Rice Sago Dosa. Whisk yogurt with few tablespoons of water, add raw rice and sago. Leave it aside for overnight in a warm place. Add the rice and sago into the grinder and grind into smooth thick paste. Use the yogurt water which is used to soak the rice if necessary to make the grinding easy. Remove the ground rice sago batter onto a bowl and stir in salt. Pour around a big scoop of rice sago batter on to the flat pan and lightly spread with back of the ladle. Layer the thick dosa with chopped onion and green chiles. Pour around a tsp of oil around the dosa. Once the bottom starts to change color, turn the dosa on the other side. Let it cook for couple more minutes before removing from heat. Serve rice sago dosa immediately with any pickle of your choice. Notes: Make sure to soak the rice well. Suggestions: Adjust the consistency of the batter with the yogurt liquid in which the rice is soaked. The batter can be stored in the refrigerator for couple of days if necessary. Variations: If dosa batter becomes too thin, add a tbsp or so of rice flour. If dosa batter becomes too thick, adjust with water. Other Names: Rice Sago Dosa. 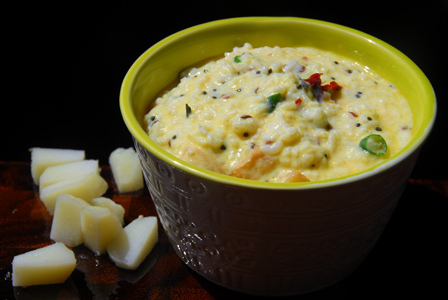 Rice rawa upma is mixed with rice flour to form soft wet mixture. Rice raw mixture is spreaded on a flat pan into somewhat thin rotti. Cook the rice rawa rotti till it turns golden brown on bottom side. 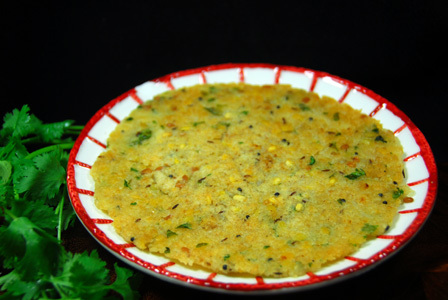 Serve rice rawa rotti it with any pickle of your choice. Makes: 1 Serving of Rice Rawa Rotti. Wash and finely chop cilantro. In a mixing bowl, add rice rawa upma, rice flour, cilantro and salt. Stir well and make it into a soft wet mixture. Add a few splashes of water if necessary to wet the rice flour. Place rice rawa mixture on the pan and spread it with wet finger into somewhat thin rotti. Pour around quarter teaspoon of oil around the spread rice rawa rotti. Cook till the bottom turns golden brown and carefully turn on other side if necessary. Cook again for couple of minutes till golden brown and remove from heat. Serve rice rawa rotti with any pickle of your choice. Notes: Make sure to cook the rotti well on one side before turning on other sie. 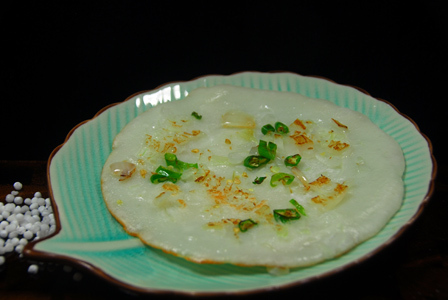 Suggestions: Make sure to warm up the rice rawa so that it gets easy while mixing with rice flour it. Variations: Add finely chopped green chiles to the mixture for spice. You can also add lemon juice to the rice rawa mixture. Check other rice varieties here. Other Names: Rice Rawa Rotti. Fresh or leftover kattu pongali / ven pongal can be made into small balls. They are then deep fried in oil till golden brown and crisp on the outside. Serve pongali fritters as a snack with any pickle of your choice. 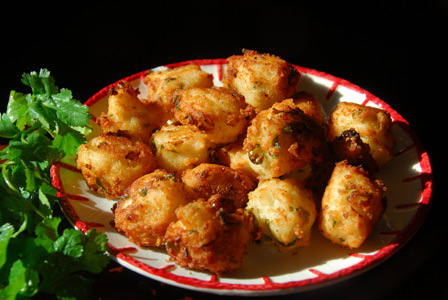 Makes: around 7 Pongali Fritters. Wash and tear the curry leaves. In a mixing bowl, mash the pongali with curry leaves and lemon juice and make into small golf sized balls. Heat oil in a deep vessel on medium heat. When oil gets hot, carefully drop the pongali balls into the oil. Fry till pongali balls turn golden brown on all sides. Turn the pongali balls if required during the frying process. Serve pongali fritters as a snack with any pickle of your choice. Notes: Make sure the balls are tight so they don’t break in the oil. 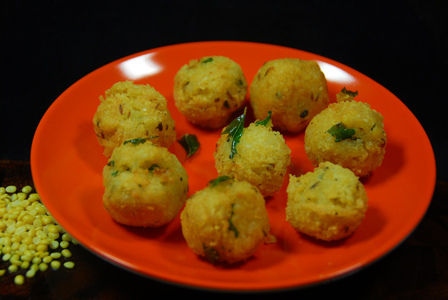 Suggestions: If pongali is very wet, add a tbsp of rice flour to the pongali and make into balls. Variations: You can also add very finely chopped onion and green chile to the pongali before making them into balls. Other Names: Pongali Fritters, Kattu Pongali Pakodi.